The Abductor Hallucis muscle originates from the medial processes of the calcaneal tuberosity, which is a part of the heel bone and the flexor digitorum brevis muscle. The abductor hallucis muscle supports a soft tissue bulge on the medial side of the sole and forms the medial margin of the foot. The medial process of the calcaneal tuberosity. The intermuscular septum in between this muscle and flexor digitorum brevis. Large oblique head from bases of the 2nd, 3rd, and 4th metatarsals. Small transverse head from the plantar ligaments of the metatarso-phalangeal joints of 3rd, 4th, and 5th toes. Abductor hallucis goes forward its muscle body, which is fairly thick behind, flattens. It ends in a common tendon with the medial head of the flexor hallucis brevis that enters on the medial surface of the base of the first proximal phalanx and its related sesamoid bone. Its medial surface is superficial and covered up with the muscle’s fascia and the skin. The muscle fibers end in a tendon that is attached, to the medial side of the base of the proximal phalanx of the great toe, along with the medial tendon of flexor hallucis brevis. Regularly, the medial sesamoid bone of this toe has some fibers connected more proximally. Along the medial border of the foot, the muscle may also send some fibers to the dermis. 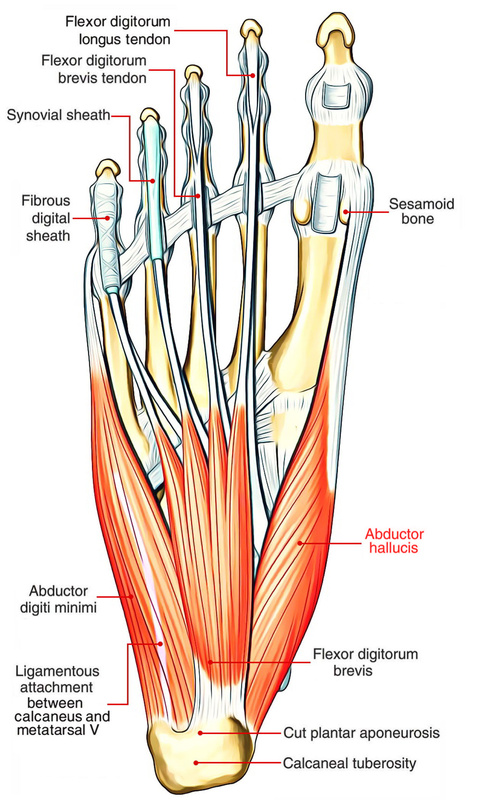 Abductor hallucis covers the origins of the plantar vessels and nerves and lies along the medial border of the foot. The space created for the plantar nerves and vessels by abductor hallucis and its relationship to the calcaneus is called the porta pedis. Abduction of the great toe. Abductor hallucis can serve as a bow-string to the arch when the foot is being used for moving the body forwards. Due to its position along the medial side of the foot, it is attached at the back and front of the medial longitudinal arch. Its attachment to the medial side of the great toe likewise helps in controlling the central position of this toe when it is being flexed. When the muscle contracts hard, the great toe does certainly move medially, the foot is located laterally, thus improving the relationship in between great toe and medial side of the foot. Abductor hallucis is innervated by the medial plantar nerve, a branch of the tibial nerve. Abductor hallucis is supplied by Medial planar artery. Abductor hallucis is tested clinically by advising the subject to withstand a forcibly applied lateral turning of the proximal phalanx.